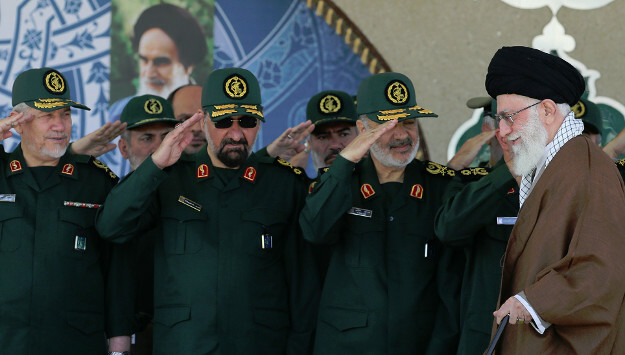 Earlier this year, Iranian Defense Minister Amir Hatami said Supreme Leader Ali Khamenei had ordered the country’s powerful Islamic Revolution Guards Corps (IRGC) to reduce its economic activities, raising the hope that the regime has decided to loosen the IRGC’s grip on the economy. But IRGC leaders swiftly rejected any notion that it would divest from energy and commercial assets. The latest statement by the head of the Khatam al-Anbia Construction Base, the IRGC’s main engineering arm, indicates that the Guards, quite the contrary, is seeking to exploit the departure of foreign firms in the wake of the U.S. withdrawal from the nuclear accord and further expand its economic activities, particularly in the lucrative energy and construction industries. General Ebadollah Abdollahi, the commander of Khatam al-Anbia, said this week that the conglomerate will implement 40 mega projects in the current Iranian calendar year, which ends in March 2019. Speaking on the sidelines of a conference on “Resistance Economy, Abdollahi explained that most of these projects are designed to manage the country’s waters and develop its oil and gas fields. He pointed out that Khatam al-Anbia has already completed several major projects in the oil sector, underscoring that the second phase of the Persian Gulf Star Refinery is now ready for operation. Abdollahi also revealed that the IRGC construction company is on course to complete a mega water supply project in western Iran by the year’s end. The project covers 1460 kilometers and includes 17 dams, 150 kilometers of tunnels and 700 kilometers of transmission lines. In addition, Abdollahi said Khatam al-Anbia has submitted proposals to the Ministry of Energy for the design and implementation of several major water projects in central and eastern provinces. More than a half of the country’s water reservoirs have been built by Khatam al-Anbia, he added. While Abdollahi claims that Khatam al-Anbia’s water management projects will alleviate the growing water scarcity in the country, many water experts and environmentalists are concerned that the Guards’ continuing dam construction projects will make the problem even worse. The IRGC has built hundreds of dams over the past three decades, changing the natural direction of water flow and favoring the elites at the expense of ordinary Iranians. And when experts try to address the problems and question IRGC's disastrous policies, they often end up in jail. In a New Year message addressed to the Iranian people in March, the White House noted that IRGC dam construction has dried rivers and created environmental issues in the country. The latest mega water project in western Iran will also exacerbate water problems in neighboring Iraq. Tehran has already restricted the flow of water into Iraqi Kurdistan, pushing Iraq’s water problems to crisis point. The construction of 17 dams in western Iran will only add to the problem. Abdollahi also emphasized that the IRGC conglomerate is ready to fill the vacuum created by departing foreign firms because of U.S. sanctions, but pointed out that Khatam al-Anbia would be willing to partner with foreign companies and investment banks still interested to do business with Iran – indicating that the Guards are seeking to exploit the return of U.S. sanctions by taking over key gas and oil projects initially planned for investment and exploration by major European and Asian companies. As Washington is set to reinstate sanctions on Iran, IRGC leaders argue that its business firms should be given an even bigger role to strengthen “resistance economy” – a term used by Iranian leaders to emphasize reliance on domestic capacities rather than foreign investment to improve the country’s ailing economy. The Rouhani government and some lawmakers have expressed the worry that Khatam al-Anbia’s increasing role in the economy has stifled the private sector. But Abdollahi has dismissed the criticism in the past, claiming that his organization is currently working with 5,000 companies to jointly implement construction and other projects. He also cites that nearly a quarter million people work on Khatam al-Anbia’s projects across the country. When Hatami spoke about the need for IRGC to leave economic projects not related to its domain of work, Abdollahi’s response was one of defiance. “We successfully ended the war [with Iraq] with the support of the people and we emerged victorious against all super powers. Today, work needs to be done for construction and development projects,” he added. And the IRGC general further revealed that it Khatam al-Anbia will increase its role in projects relating to the energy industry, water management, and other key sectors. Other IRGC leaders echoed a similar view. “According to the law, the armed forces in peacetime need to help the government. Based on this, since the end of the [1980s Iran-Iraq] war, Sepah has executed construction work that other companies were unable to deliver,” said Brigadier General Esmail Kowsari, the deputy commander of IRGC’s Sarallah Unit, which is responsible for security in Tehran. “The construction activity of Sepah [IRGC] is based on Ayatollah Khamenei’s permission,” he stressed. Founded by the Islamic Republic’s founder Grand Ayatollah Ruhollah Khomeini after the 1979 revolution to safeguard the regime from internal and external threats, the IRGC has not only evolved into Iran’s most powerful military force but also dominates the country’s key economic sectors, such as energy, construction, telecommunication, media, mining, electronics, automobile, banking, and more. Last year, IRGC’s Chief Commander Major General Mohammad Ali Jafari announced that his forces are now also involved in Iran’s agricultural industry. While IRGC leaders argue that their economic activities are aimed at helping the country’s policy of “resistance economy” and helping the poor, the elite force in reality spends most of its revenues on military expenditures at home and abroad. Khatam al-Anbia, and other IRGC-affiliated companies, benefited greatly from the privatization program of former President Mahmoud Ahmadinejad. In 2006, the company secured deals worth at least $7 billion in the oil, gas, transportation and other sectors. Khatam al-Anbia is not merely a construction firm. The IRGC conglomerate has significant political and economic power in Iran and funds IRGC’s operations abroad. The organization and its front companies also implement projects in regional countries, particularly in conflict zones such as Syria and Iraq. In October 2007, the U.S. Department of Treasury designated Khatam al-Anbia and several other IRGC companies under EO 13382 as part of a plan to counter Iran’s bid for nuclear capabilities and support for terrorism. And in February 2010, the Treasury took further steps against Khatam al-Anbia by designating the company’s then-commander, General Rostam Ghassemi, and its subsidiary companies. As the Treasury noted, the IRGC uses profits from Khatam al-Anbia for its illicit activities, including nuclear proliferation and support for terrorism in the region.